Arkadelphia is an outdoorsy, mountainside rural community in one of the oldest areas in Arkansas.With a population of just over 10,000, the cost of living is underneath the national average. Lakes, rivers, and a national park make Arkadelphia a great place to get outside. A college town, there are two universities here. Photo of town hall courtesy of cityofarkadelphia.com. According to Zillow.com, the median listing price was $139,925 in late 2018. The colleges give Arkadelphia a youthful feel. 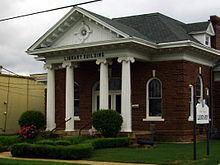 The Senior Adult Center offers a wide swath of activities and programs. There is a high poverty rate, and tornado risk. It gets hot and humid in the summers, and winter temperatures range from the 30s to low 60s. 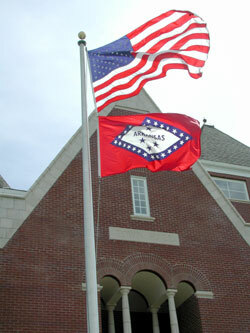 The Ross Foundation is a private philanthropic organization that has offered services for civil, cultural and educational opportunities in town; Arkadelphia Arts Center hosts exhibits, productions and classes; Arkadelphia's historic train depot serves as the Clark County Historical Museum, along with also serving as the town's operating Amtrak Station. Henderson State University serves as a central resource for children, families and adults, offering opportunities to learn new skills, and hobbies. The Baptist Health Medical Center is in town. Dexter B Florence Memorial Field Airport; Amtrak; Arkadelphia is above average in walkability when compared to other towns.